If you are in the market for a new tablet but don’t fancy paying an inflated price for features that you will never even use, this article is for you. To be more specific, every tablet on this list comes in at less than $150. While it’s true that you won’t be picking up the latest iPad for such a small budget, that doesn’t mean you can’t find a high quality tablet with top specifications at this price point. Our team have been working around the clock to find you the best value tablet that doesn’t cost an arm and a leg. We have compared these tablets against a range of features and specifications you should be looking for when purchasing a tablet. If you are in a rush – The best tablet under $150 is the Dragon Touch X10, simply because it has the most powerful processor, the largest display and the most amount of praise from tablet fanatics. To kick things off, let’s take a look at the features that make a tablet a good choice. As with all other technology products, the lower in price that you go, the more products you tend to find. The ‘budget’ market is huge, and tech companies know this. To find the best tablets at this price point, we had to dig through literally hundreds that were cheaply made and not worth the packaging they were shipped in. Once we had figured out the most important features to take into consideration, we cross checked all of the tablets we could find and managed to narrow our selection down to the best five. From our research and the feedback we have received from the tech-heads that we spoke to, the most important aspect of a tablet, overall, is it’s processor. Obviously, what you will be using the tablet for will come into play here, as different uses will require different levels of processing power, for example a tablet for a child to play simple games on will require less processing power than a tablet designed for a working professional. Regardless of what you intend to use your tablet for, it’s worth keeping in mind that more processing power is always better. The processor is the life-force of the tablet, so the more powerful it is, the faster and more efficiently your tablet will run. Different manufacturers will use different terms to describe how ‘powerful’ a processor is, but to keep things simple, the main indicators of performance will be the Gigahertz (GHz) and the number of cores it has. A tablet with more Gigahertz and more cores will generally run better than a tablet with fewer of both. Of course, there are exceptions, as the processor is not the only contributing factor, but in general this holds true. For comparisons sake, our top pick, the Dragon Touch X10 is equipped with 8 cores (Octa-Core) and runs up to 2.0GHz. This processing power, along with a few other features are the reason it’s currently in the top spot. Another important feature that you need to take into consideration is the operating system that the tablet runs. If you are experienced using a specific operating system, say on your cell phone or laptop, you will probably be more suited to a tablet that runs the same one. Android is the most common operating system for non-apple products. Chances are, if you have never owned an iPhone, you will already be comfortable with the Android operating system. Second of all, the Android App Store is absolutely stacked with all of the apps you could ever want, allowing you to customize your tablet to your own specific needs. Whether you are looking for games or productivity apps, the App Store has got them. Finally, the Android OS is generally more affordable. While you aren’t really purchasing the OS on it’s own, it’s well-known that an Apple product is going to cost considerably more than a product that is running Android. Even if we bumped your budget up to $300, we would still struggle to find you an Apple tablet. The display generally refers to the size of the screen, and it’s an important feature to keep in consideration when you are looking to purchase a new tablet. The displays on modern tablets will typically fall between 7 and 10 inches, with some of the more expensive ones going up to 18 inches. The most important question to ask yourself is what do I want this tablet for? If you need something portable, that is easy to move around, a tablet with an 18 inch display is probably not the right choice for you. If you want a tablet to watch movies and YouTube videos, then a bigger display is going to make the experience more enjoyable. There are pros and cons to each display size. It all depends on your own personal needs. There are few things in life more frustrating than reaching full storage capacity and having to constantly remove old apps and content to make space for new ones. To make sure this never happens, it’s a good idea to keep in mind the storage capacity when purchasing your new tablet. New tablets will typically come with either 8GB or 16GB of storage, with some of the more expensive models ranging up to 256GB and beyond. If you are a casual user who doesn’t download a lot of content, or carry a lot of personal files on your tablet, a 16GB tablet will probably suffice. If you love to download movies and music, then you will probably swallow up 16GB’s relatively quickly. Luckily, a lot of modern day tablets will come with external storage capabilities such as an SD card slot, so if you ever need the extra space you can always expand. If you have ever owned a cell phone with poor battery life, you will understand the frustration of constantly having to find the nearest charger to make sure your phone has a bit of life for the rest of the day. Choosing a tablet with a good battery life is the best way to combat this issue. The majority of tablets on the market today will typically last at least 8 hours on a full charge, which should be more than enough for a days worth of usage. We wouldn’t recommend purchasing a tablet with a battery life of less than 7 hours. Not only will you be constantly on charge, it pretty much shows the quality of the hardware that the manufacturers have used. If they use a poor battery, what makes you think they won’t use a poor performing everything else? First of all, this tablet is cheap. If your budget is $150, you can pick this up and have change to spare. When you look at the performance that this little machine offers for such a low price, you will be scratching your head wondering how these companies are making any money. The most important aspect of a good tablet, in our opinion is the processing power. The X10 is equipped with 8 cores and 1GB of ram. This tablet will browse the internet, consume media on YouTube and Netflix, run office applications and even do some light gaming without any issues at all. If you are interested in playing games that are more on the demanding side of things, we would recommend that you up your budget and try something a little more expensive. You won’t find a lot of gaming power at this price range. However, for light games such as Temple Run, this tablet is spot on. If you are thinking of purchasing this for a child? The X10 will more than powerful enough to run their favorite games. With a 10.6 inch display and a 720p HD IPS panel, any games that you do decide to play will look fantastic. The same goes for YouTube videos or films on Netflix. It’s not quite 1080p, but on a small screen like this you will struggle to see much difference anyway. The Dragon Touch X10 comes with Android 5.1 pre-installed, which isn’t Google’s latest version of Android, but it’s more than sufficient. In the future, they may think about upgrading to Android 6.0, but until then, 5.1 Lollipop does the job just fine. If you are looking for a tablet with a good, solid battery life then this will be the best choice for you. With it’s 7200 mAH battery, the X10 will easily last a full day of casual browsing and running light apps and games. For more intense gaming sessions, you can expect to recharge after a few hours but the same applies to tablets of all price ranges. Finally, the Dragon Touch X10 comes equipped with built-in speakers (which aren’t the best, but the 3.5mm headphones jack comes in handy), a microSD slot (in case the 16GB built-in memory is not enough), a microUSB and a USB 2.0 port, a mini HDMI port and two cameras, 2MP on the front and 5MP on the back. Tablets are not built to take pictures. That has never been the intention of any tablet manufacturers. However, the cameras are good enough for Skype calls. Just don’t expect DSLR camera quality from this thing. Overall, the Dragon Touch X10 is an absolute beast of a machine for the amount of dollars it will cost you. It may not compete with the iPads of the world, but for the budget conscious consumer, it’s a brilliant machine that will certainly surprise you. 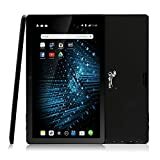 Although we crowned the Dragon Touch X10 as the number one budget tablet, it was a very close decision that took a lot of back and forth debating. The other four tablets on this list are just as worthy as the X10. So, if the X10 didn’t tickle your fancy, we would still recommend any of the following tablets. 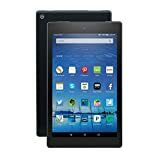 In a close second is the Fire HD 8 from Amazon. The display is slightly smaller than the X10, measuring just 8 inches, but with a 1280×800 pixel-panel, you would expect it to look a little bit better. The colors on the Fire HD are decent enough for watching movies and YouTube videos, but don’t expect to be blown away. The colors have been described as slightly dull by some. In terms of processing power, the Fire HD 8 is equipped with a quad-core processor which runs at 1.3GHz. Combined with the 1.5GB of ram, this Amazon owned tablet is more than capable of running light apps, casual browsing and media consumption without lag. Battery life is fantastic, with some usability tests reporting an 11 hour battery life when used for basic web browsing. Pretty impressive. The Fire Hd operates on Amazon’s own OS, which is basically a remodel of Google’s Android. The Amazon app store is not as popular, or as populated as the Play Store but it’s still got enough apps to keep the casual user busy. Available in four different colors (Black, magneto, blue and tangerine), and with a surprising 32GB of built-in storage, the Amazon Fire HD is a trendy and powerful all-rounder that is a steal for the price. If you need something cheap, reliable and you want to buy from a brand you can trust, then the Fire HD is probably the tablet for you. Another well-known and reliable brand to release a budget friendly tablet under $150 is Samsung. The Galaxy Tab A is only small, with its 7” display and only 8GB of storage, but it’s a decent entry-level tablet for the budget minded buyer. The IPS panel runs with the same level of pixels as the Fire HD (1280×800) but the colors are reported to be a little bit crisper and sharper, which could be due to the smaller screen. The touchscreen is responsive and the 1.3GHz processor helps the tablet run smoothly without any lag. Again, the Tab A only has a built-in storage capacity of 8GB but it has a microSD slot if that’s not going to enough, which it probably isn’t. The operating system that comes pre-installed is the Android 5.1.1, which isn’t the most up-to-date version. However, with Samsung being a large company, we won’t be surprised if they release an update to 6.0 relatively soon. Overall, the Galaxy Tab A is a reliable tablet that is perfect for the casual user. Don’t expect too much from it and you won’t be disappointed. If this article was reviewing the best tablets under $100, then the Iconia One would probably have emerged victorious. Although the Dragon Touch X10 is slightly superior on almost every specification, the Iconia One is not far behind. The screen is a little bit smaller than the X10’s, at only 7”, as well as only half the number of cores (four in total), but compared to the other tablets on this list, it will give them all a run for their money. The Iconia One has a built in memory of 16GB and runs Android 5.0 Lollipop. An SD card slot is built into the side, so there is always the ability to upgrade if needs be. Due to it’s size and light weight (9.9 ounces), this Acer tablet is perfect for those who need something portable, but powerful enough to still manage day to day tasks and light entertainment. The only area in which the Iconia lags a little bit is the battery life. Several users have reported a poor battery performance. So, while it is definitely a portable tablet, we wouldn’t recommend trekking too far away from a power supply if you need to be constantly connected. This tablet was never going to be our number one pick, but with it being the cheapest on the list, if you are looking for something considerably cheaper than $150, this is the one for you. Last but not least we have the G Pad 8.3 from LG. If there is any area that the G Pad beats all of the other tablets on this list, it’s the sound quality of the speakers. Tablet speakers tend to sound tinny and flat, but the G Pad has a great pair of built in speakers if good quality sound is something you are looking for. It’s not just the speakers that stuck out to us either. The processing power of the G Pad is surprisingly good, with a quad-core processor and a Qualcomm Snapdragon Chipset, which is basically a bunch of fancy words to say that it runs well. We can vouch for that. The display on this LG tablet is stunning. It’s the only true HD display on our list, and the ultra thin bezel makes the 1920×1200 display look even better than it already is. The screen itself measures in at 8.3 inches, and the entire device weighs less than 5 ounces. With the superior sound quality and the unbelievably sharp display, the LG G Pad is ideal for those who consume a lot of media such as YouTube and Netflix. Games will also look fantastic on this thing, if that’s what you are into. The processor isn’t as powerful as our number one pick, so don’t expect anything more than light gaming, but in terms of the display, this has the X10 beat, hands-down. As you can probably tell, every single tablet on this list could have been crowned the winner of our top spot for a myriad of different reasons. They all excel in their own ways. The reason we ultimately decided upon the Dragon Touch X10 is purely due to the processing power, and the fact that it doesn’t really lack in any areas. It’s the perfect ‘all-rounder’. Whichever tablet you decide to go with, we know that you will be picking up a beast of a tablet for next to nothing. You won’t be disappointed with any. We've found the Best Tablets for under $150 and ranked them from top to bottom. There's plenty of great budget tablets that are powerful, with nice specs.